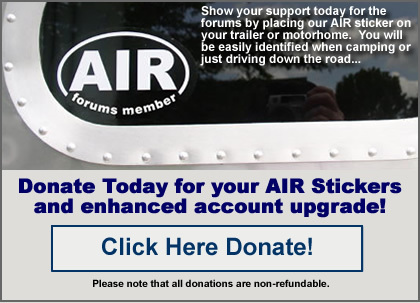 We are please to announce that the official AirstreamForums.com "AIR" stickers are now available. These stickers are intended to be an easy way to spot fellow forum members when at rallies, driving down the road or parked in someone's driveway. AirstreamForums.com is a valuable resource to the Airstream community. As one of the largest repositories of Airstream related information on the internet many of our members save tons of money from the knowledge they gain on "the forums". This is your opportunity to give back and say "thank you". By making a small donation ($20 or more) you will receive 2 AIR stickers (one with a white background and blue letters and the other with a clear background and white letters). Over 54,000 discussions on virtually every Airstream topic conceivable. Over 21,000 photos covering nearly every model of Airstream ever made! A terrific Rally Calendar that also shows you who is attending which rallies. The best Airstream Classifieds on the internet with usually over 350 Trailers & Motorhomes for sale! A "Live" Airstream Chat Room with lively discussions every Tuesday night! An Airstream link directory featuring links to WBCCI sites, personal web pages and other sites of interest for Airstream enthusiasts. Campground directory with over 80 campgrounds listed! As many of you know, you can save hundreds (if not thousands) of dollars in repairs by reading about solutions on the forums. Please take into consideration how much you have saved (or will save) when making your donation! Andy -- You and Jack Canavera have labored long and hard on this passion for Airstreams. I know the sweet and bittersweet of the time dedicated to a cause. Thank you for your perseverance!! The PayPal is in the mail. Do you get my shipping address with that? Your address is NOT sent to our system from PayPal. Please check your PM with instructions on updating your address in your profile. We will be using that address to send stickers. The plan is to send stickers once a week so we can do this in bunches. Don't even WANT to think about how many cents per hour my stickers are costing - worth the price to see when SILVERTWINKIE tops 5,000 posts! I like it! Hooray! Can we get additional stickers in choice of white or blue? Additional stickers will be available soon (to those that have upgraded). Also, don't forget you can increase your avatar to the larger 160x80 pixel size. Show off your new avatar today! thanks for the tcl.....it will be our little secret! Thanks Andy. We're in and look forward to putting one on our Classic and one on the T.V. I've entered in my paypal purchase. Looking forward to being a able to display the "offical" Airstream Forums sticker on my rig. We're in! Andy, Will this also support the WallyWiki as well? 2air your shinier rivets are already blinding me. look forward to adding the stickers to my trailers. i see the donation is non-refundable. i'm guessing it's non-tax deductable as well? any accountant in the house? this site is certainly a better value than trailer life magazine subscription. i pretty much lurk here almost everyday. ps - just sent my payment in for the DC Unit Cherry Bblossom Rally. finally...our first rally. although, i feel like every weekend is a rally at Jersey Shore Haven Airstream Park.